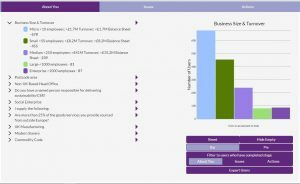 The NETpositive Supplier Engagement Tool enables all of your suppliers to develop a NETpositive Sustainability action plan in line with your environmental, sustainability and institutional objectives. The Tool allows you to support all of your suppliers to go beyond a commitment to sustainability and provides them with a customised action plan, which can be monitored and measured. 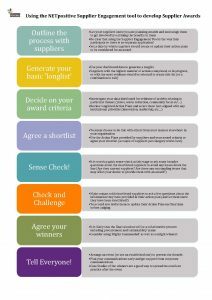 As the main client you are then able to interrogate the data this process generates to help plan your supplier engagement activities on sustainability, gather evidence of good practice and use the action plan developed to provide a clear and measurable focus for contract management discussions. Click on the image below to have a look at some screenshots of the data dashboard. 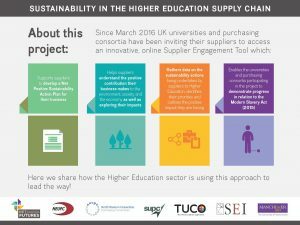 The University of Manchester was the first of our Tool providers to hold a supplier awards event using the data from its dashboard to recognise and reward sustainability in its supply chain. 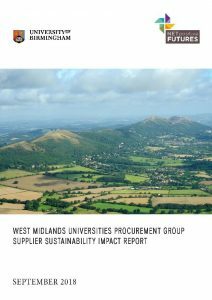 Since then the University of Birmingham has also held supplier awards. NETpositive Futures Ltd will use the information you provide on this form to be in touch with you to provide updates and relevant information in respect of the Supplier Engagement Tool only. You can change your mind at any time by clicking the unsubscribe link in the footer of any email you receive from us, or by contacting us at admin@netpositivefutures.co.uk. We will treat your information with respect. For more information about our privacy practices please visit our website.